This is the second decan (constellation) of Capricornus — and it is very closely associated with Sagitta and Delphinus. If you haven’t already read the page on Sagitta, please do so before beginning your study on this page. There is very little mythology associated with Aquilla even though this sign has been known from the earliest of recorded history. There is some connection between it and Aquarius, but little else is known. T wo of the brightest novea of all recorded astronomy have appeared in this constellation — the first in A.D. 389 and the second on June 8, 1918. They each rivaled Venus in brilliance, but each lasted only a few days before dwindling to only a speck and then vanishing. 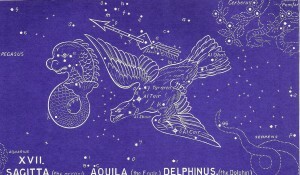 Aquilla is the eagle in the picture above. An eagle is symbolically used to represent diety, and yet here it is falling down in death to its burial because the arrow, Sagitta has just passed through it. Notice that the entry wound caused a break in the tail feathers, so the entry would be close to that. Now, notice the meaning of one of the star names Al Okal, which means “wounded in the heel.” We wouldn’t even consider an eagle to have a heel — so this is clearly a reference to that old Seed Prophecy we saw in Genesis 3:15. AMAZING!!!! We discovered in our study of Sagitta, that entering into the blessings of Christ is dependent upon our full and unconditional surrender to His authority in our lives — and that surrender is our being “crucified with” Him. Of course, there is an important difference in what Christ did for us on the cross and what we do daily. When WE are obedient, we receive back from Him an over-abundance of His life in us — His peace, His love, His joy — in other words, Him! That is the meaning of Gospel-blessings! And as we were invited to be crucified with Christ, this constellation Aquilla reminds us that we are also invited to enter into His burial. So what exactly are we buried to? What is it about the burial of Christ that should become personalized in our life? The answer is simple. Burial implies forgiveness and forgetfulness. When we place a corpse in the grave, it is obvious that it is no longer subject to the powers that rule men — our laws, institutions, cruelties, etc. We can enter into that same kind of freedom when we are buried with Christ. Now – please understand — we are speaking spiritually. By Christ’s own command, we are to be subject to the authorities over us. But we are no longer subject to The Law — that Law that was given by God Himself to Moses on Mt. Sinai. We are buried (free!) of its impossible demands, rigors, wrath, and punishments! Romans 6 and 7 assures us of this. We are free to serve Another! The Law can only kill — but the Spirit can both kill AND raise to newness of life. That is the good news of Aquilla! We are an old dead thing, no longer under the jurisdiction of the Satan. We have a new master, who has called us friend — Jesus Christ. 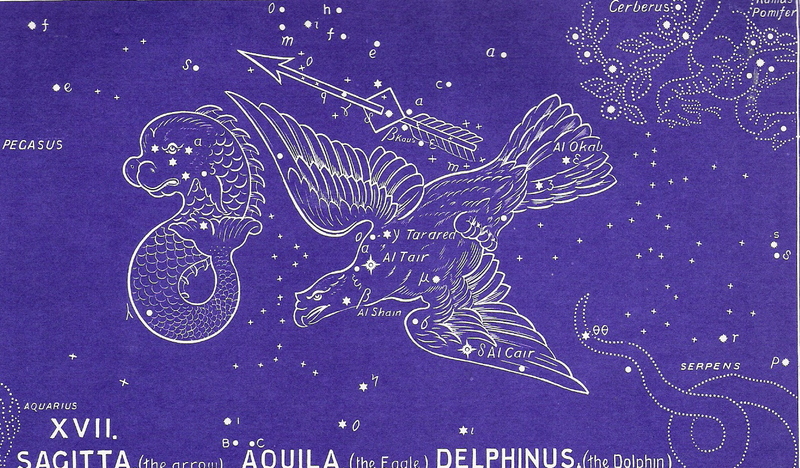 To continue in the correct order of the ancient star chart, please select Delphinus next. Also be sure to download our free e-book that discusses the historical evidences for this amazing star revelation!